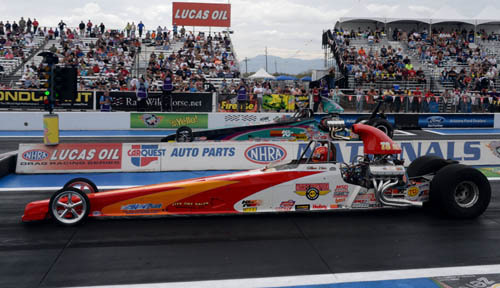 CHANDLER Ariz. - Justin Lamb scored his 13th NHRA national event win while Bernie Polvadore and Trevor Ritchie each grabbed their first this past weekend at the CARQUEST Auto Parts NHRA Nationals at Wild Horse Pass Motorsports Park and the NHRA Lucas Oil Drag Racing Series. Lamb, Henderson, Nev., had a .013 second reaction time in his '10 Cobalt to take the early lead and stayed out front posting a 7.972 second run at 172.43 mph. The win was Lambs second in Comp Eliminator as he knocked out Doug Lambeck, Mike DePalma and Dan Fletcher on his way to the final with Alan Ellis who was coming off a season opening win at Auto Club Raceway at Pomona. Ellis went 6.529, 207.08 mph in his '23 Ford for his runner up finish. Sun City, Ariz., racer Polvadore turned his starting line advantage in to a win as did Ritchie of Sherwood Park, Alb. 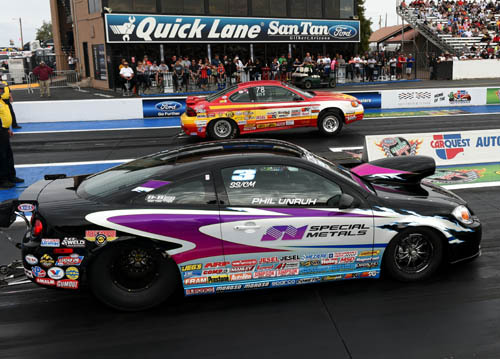 Polvadore was .004 on the tree and held off the hard charging Brad Pierce, Riverside, Calif., for the win in Super Gas. Ritchie clocked in at 6.815, 191.81 mph in defeating John Taylor II, all the way from Oley, Pa., in Top Dragster. Ed Olpin defended his event championship from a year ago in Top Sportsman but had to earn it over Jimmy Lewis who was the runner up in Super Comp two weeks ago in Pomona, Calif. Olpin, Pleasant Grove, Utah, and Lewis, Forney, Texas, were .001 and .002 seconds off the start with Olpin taking the win and his fourth at the national level in 7.272 seconds at 189.63 mph. Glenn Kern won for just the second time in his career having won for the first time over 25 years ago in Seattle. 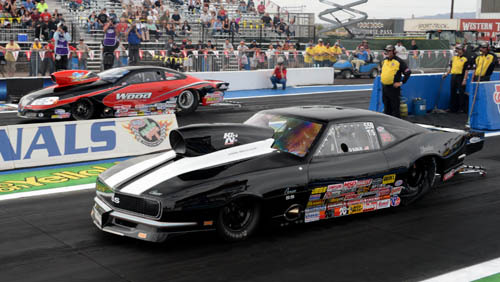 The Modesto, Calif., resident faced off with Steve Williams, Beaumont, Calif., as Kern was better at both ends of the track for the Super Comp win in 8.912 seconds, 168.96 mph. 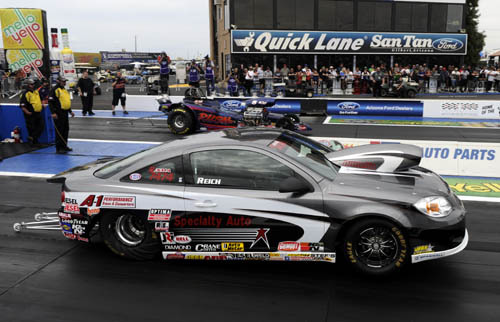 Williams, who took the Super Gas title in Pomona, crossed the line in 8.949, 166.42 for his runner up finish. Phil Unruh and Kyle Seipel rounded out the winners with Unruh, McPherson, Kan., earning his third and Seipel, Pleasanton, Calif., his tenth. Unruh took the hole shot over Don Thomas, who was looking for his first national event win, and won on a double breakout in 8.525 seconds at 155.22 in his '10 Cobalt to take home the hardware in Super Stock. Thomas, Spruce Grove, Alb., covered the quarter mile in 10.078, 131.56. Seipel met up with Kyle Rizzoli and his '69 Camaro out of San Luis Obispo, as the two were close at the start of the Stock Eliminator final but Rizzoli ran too quick at 10.386 on his 10.41 dial. 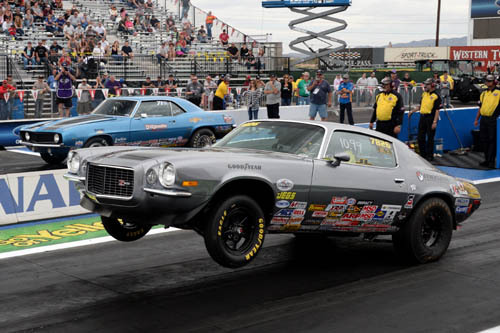 Seipel was 11.020 on his 10.99 dial for the win and the NHRA Wally trophy in his '70 Camaro. 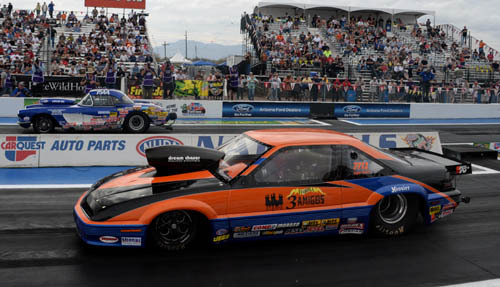 NHRA Pacific Division racers are back at Wild Horse Pass Motorsports Park next weekend for the Pacific Division NHRA Lucas Oil Drag Racing Series season opener, Feb. 27-Mar. 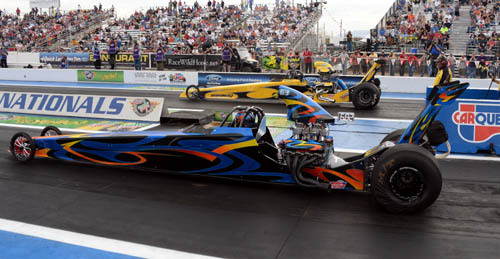 1 The event will be highlighted by the Top Alcohol Dragster and Funny Car classes. Justin Lamb, Cobalt, 7.972, 172.43 def. Alan Ellis, '23-T Ford, 6.529, 207.08. Phil Unruh, Cobalt, 8.525, 155.22 def. Don Thomas, Grand Am, 10.078, 131.56. Kyle Seipel, Camaro, 11.020, 106.34 def. Kyle Rizzoli, Camaro, 10.386, 117.60. Glenn Kern, Dragster, 8.912, 168.96 def. Steve Williams, Dragster, 8.949, 166.42. Bernie Polvadore, Grand Prix, 9.912, 163.45 def. Brad Pierce, Corvette, 9.902, 139.00. Ed Olpin, Camaro, 7.272, 189.63 def. Jimmy Lewis, GXP, 6.995, 190.40. Trevor Ritchie, Dragster, 6.815, 191.81 def. John Taylor II, Dragster, 6.944, 191.08.